Have you ever been to Jamba Juice and seen them juicing fresh grass behind the counter? Or have you curiously watched while someone downs a shot glass of green liquid instead of drinking a smoothie? Well, I have, and it made me very curious. I deduced from the Jamba menu that these people were creating/drinking something called wheatgrass juice, and I set out to learn more. 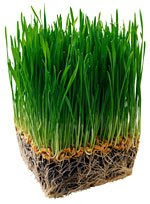 I found out that wheatgrass is a type of plant, which looks a lot like the kind of grass you grow on your lawn (although it is actually a young gluten-free form of wheat). There are many, often extreme claims about the health benefits of wheatgrass of which various critics are skeptical. The supporters of wheatgrass claim that it has extremely high amino acid, vitamin, mineral and chrolophyll content. The supposed benefits are that it helps prevent diabetes, heart disease, hair loss and cancer while promoting a general feeling of well being by promoting better blood flow and detoxification. As you probably would suspect, wheatgrass tastes like grass! If you want to try drinking some, and you don't like the taste of grass, then you should probably consider adding it to fruit juice or to a smoothie. I bought some frozen "ice cube" like trays (2.5 calories each) of wheatgrass juice from Whole Foods, made by a company called Evergreen, that are fun to pop in my mouth during times when I am feeling hungry (the grass taste calms my hunger). I'm sure I could achieve a similar effect with frozen juice, but when I eat wheatgrass I feel like I'm doing something good for my body, since wheatgrass juice is probably at least as good for me as eating any other green vegetable, if not better! that's really a new product...I've never thought about wheatgrass juice. How it tastes? and what are the benefits? In terms of health benefits, some people believe wheatgrass to be like a super vegetable (in a small shot glass) -- warding off diseases like heart disease, cancer, etc. and detoxifying the body, making our skin healthy, etc. There are skeptics about how powerful it is, but at the end of the day, it has a lot going for it, just like most vegetables. Wheatgrass sure tends to polarize many people. There are an awful lot of skeptics, but there are also a large number of people who claim wheatgrass has brought them back from death's edge. Hi Juliet: Thanks for a great article. The "Raw Foodies" have been juicing wheat grass for a while now. Green smoothies are IN, FULL of green sunshiny life giving nutrition and kn liquid form these nutrients have a shuttle directly to your cells. I feel closer to earth and sun when I fill myself with green juice, but I've had a hard time drinking big glasses of green smoothie because the taste can be quite, ... well.... grassy. It's an acquired taste for SURE. p.s. There's a HEALTH link directory on my blog. Drop by and add yours for my readers to find! Keep the great articles coming! Wheatgrass has an extensive and long history. The ancient manuscripts stated that it was the grass that was the giver of life the healer. IT is pretty good stuff I really feel a difference when I do my shots and when I go with out for sometime. Anyone looking to supercharge their wellness program needs to learn about wheatgrass.